After the success of the first outing of these two forces two years ago this was an eagerly awaited event, and it did not disappoint, with a programme where virtually every item was a highlight! Congratulations to conductor James Henshaw on arranging such a superb variety of numbers, but also training the choir to ever greater heights in accuracy, feeling for the text, but above all a superb sound! 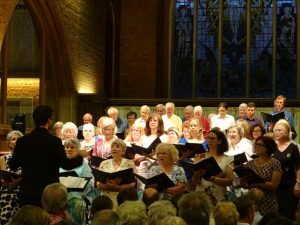 The Choral Society excelled with sprightly but tight renditions of songs such as ‘Ain’t Misbehavin’’, ‘Chatanooga Choo Choo’, and ‘I Got Rhythm’. The slower numbers ‘Moonlight Serenade’, ‘My Funny Valentine’ and ‘A Nightingale Sang In Berkeley Square’ came with a warm romantic flair with sense of style. The gentlemen offered a sharp tongue in cheek version of the cheesy barber shop quartet favourite ‘My Evaline’ and the ladies a heartfelt ‘We’ll Meet Again’. The ladies’ ensemble The Barberelles performed a beautifully jolly ‘Music! Music! Music!’ followed by ‘Ain’t We Got Fun’, firstly as everyone knows it, then with a sly current affairs informed version which referenced for example Brexit and asking whether Theresa may or may not …! Altos Lesley Clarke and Sarah Boyle presented a deliciously bluesy ‘Feeling Good’ and Winston Fane-Bailey gave us an unexpected set of lyrics for ‘Are You Lonesome Tonight?’ referencing the ailments and other issues affecting old age. The audience warmed to the wry wit of a song which apparently Elvis refused to air in public! Most of these items were underpinned by the customary brilliant piano playing of Stephen Ridge, the choir’s regular accompanist. How fortunate they are! When the choir joined forces with the band for the opening ‘Summertime’ with its excellent instrumental interlude and the concluding ‘Autumn Leaves’ and ‘Goodnight Sweetheart’ we realised we were in very special company as both teams gave outstanding performances with wonderful blending and a glorious sound. These were the highlights of the highlights, rapturously received by a very appreciative audience. Ashtead Jazz Club, performing for the first time with this line up of Tom Early,drums, Dan Foster, saxophone, Ben Trigg, piano, and Josè Canha, bass, played throughout their pieces with tremendous technical skill and emotional drive, whether accompanying the choir or in their own numbers including an enthralling ‘Georgia On My Mind’,a stonking ‘All The Things You Are’ and rousing ‘Joy Spring’. All showcased their individual musicianship with aplomb, but best of all was their so involving ensemble work. An outstanding evening! Another such collaboration? Yes, please; but could the choir and band join forces more, please?